Michigan is known for its cherries, and for good reason. They are simply delicious and a must have when visiting. Surprisingly, Michigan is the second most agriculturally diverse state in the Unites States! Its massive lakes moderate the climate, creating unique growing conditions. Stop by a farmers market or roadside stand and pick up some cherries. If you don’t eat them all on your way home, create a treat for you and your dog that you won’t soon forget. 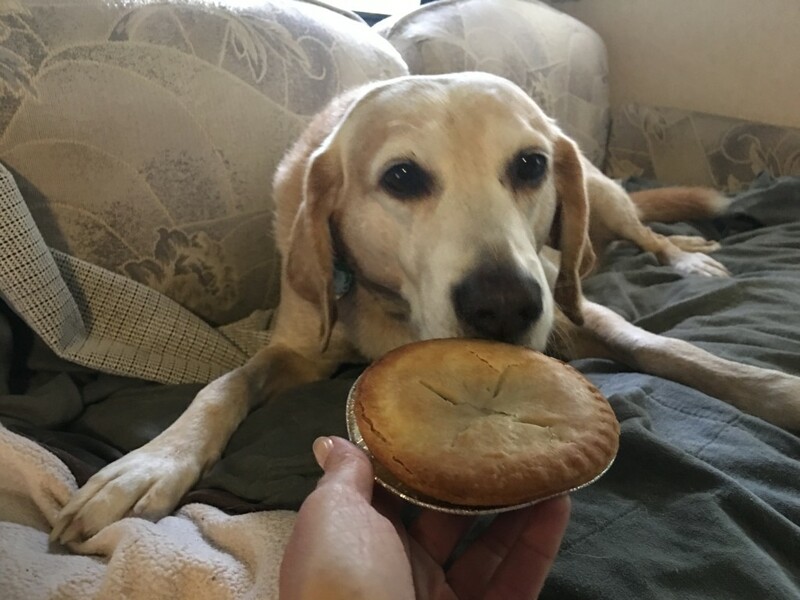 Michigan Dog-Friendly Cherry Pie. Make sure you remove ALL pits as these could be a choking hazard for your dog. Also remove the leaves which can be a hazard as well. Safety first! We have made the dogs small versions in little pie tins. This recipe is for one pie, but IF you can find small tins, keeping portion size is easier. If not, cut it up! No one will complain! In a large bowl, stir together the 1 cup honey and cornstarch; add frozen cherries and lemon juice. Gently toss until coated. Let mixture stand about 45 minutes. Prepare and roll out Two Crust Pie Shell pastry. Line a 9-inch pie plate with half of the pastry. Transfer cherry mixture to the pastry-lined pie plate. Cut slits in remaining pastry; place on filing. Trim overhangs to an even 1 inch all the way around. Tuck the crusts under and flute the edges. Lightly brush top pastry with a little water. Place pie plate on middle shelf in oven; place foil-lined baking sheet on lower rack beneath pie. Bake in a 375 degree F oven for 25 minutes. Remove foil. Bake about 50 minutes more or until filling is bubbly and crust is golden brown. Cool on a wire rack at least 2 hours before serving. Makes 8 servings. Let cool completely before serving to your dog. Disclaimer: This is meant as a treat and not a meal replacement. Limit portion. Leftovers may be refrigerated for up to 3 days or frozen for 2 months. Always check with your vet before making any changes to your dog’s diet.